Pearhead's I Love Grandpa hoto frame is a sweet and simple way for your little ones to express their love for Grandpa. 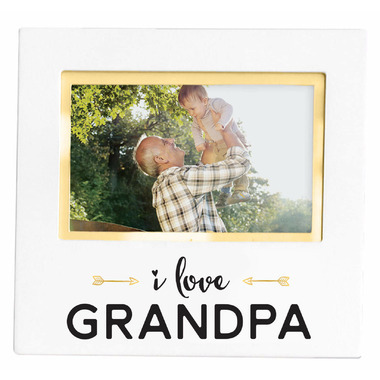 This wooden, white photo frame includes adorable saying, "I Love Grandpa", printed in black. Trendy gold foil arrow details and a matte gold foil inlay mat make this photo frame stand out. This frame includes a 4” x 6” photo opening to display the perfect picture of your little one with Grandpa. The photo frame also includes an easel and hanger to either display on any table or to hang on any wall. 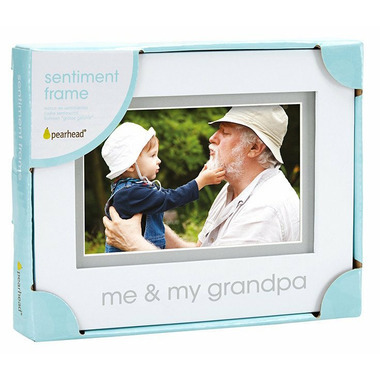 Show Grandpa how much your little one loves him with Pearhead’s photo frame. Product Dimensions: 7.25” W x 6.75” H x .5” D; Photo insert: 4" x 6"